A number of U.S.-based Muslim group leaders who vehemently reject evidence connecting them to the Egyptian Muslim Brotherhood in public made a point of publicly mourning the group's former spiritual guide, who died in prison Friday. Mohamed Akef was praised as the "Sheikh of the Mujahidin" and received prayers that Allah place him "in the higher paradise with the prophets, the pious, and the martyrs." "What kind of tyrannical regime would imprison a sick 90 years old man?" Council on American-Islamic Relations (CAIR) co-founder and Executive Director Nihad Awad wrote Saturday after Brotherhood Supreme Guide Mohamed Akef's death. "Who resisted the colonizer, and raised generations on righteousness and the love of their country? #Mahdi_Akef, consider not Allah to be oblivious." His Twitter post was in Arabic, so many of Awad's U.S. followers may not have appreciated its significance. Esam Omeish, a past Muslim American Society president who serves on the board of Northern Virginia's Dar Al-Hijrah mosque, along with a fellow board member, are among the religious leaders and political activists who publicly eulogized the Brotherhood's leader. In addition to running an organization which ultimately seeks a global Islamic government, Akef left a long history of extreme rhetoric that his mourners didn't mention. Akef led the Muslim Brotherhood from 2004-2010. During his tenure, all members had to swear a religious oath of allegiance to him known as bayah. As supreme guide, his word was absolute for members. He signed a 2004 fatwa written by Brotherhood spiritual leader Yusuf al-Qaradawi which said Muslims had "an obligation ... to kill American citizens in Iraq, since they are in Iraq in order to assist the soldiers and the occupation forces; it is forbidden however to desecrate their corpses." Bombings against American soldiers in Iraq and against Israelis in the Palestinian territories were "religious obligation[s]," Akef said months before signing that fatwa during an interview with Egypt's Al-Arabi newspaper that was translated by the Middle East Media Research Institute (MEMRI). He rejected calling Osama bin Laden a terrorist, saying the al-Qaida leader was "without a shadow of a doubt – a jihad fighter. I do not doubt the fact that he opposes occupation, nor that he does this in order to get closer to Allah, may He be praised and extolled," Akef said in a 2008 interview with the website Elaph.com. Akef was just 12 years old when he joined the Muslim Brotherhood in 1940. He worked closely with founder Hasan Al-Banna and spent more than 20 years in Egyptian prisons. Akef joined the Muslim Brotherhood's "secret apparatus" that was involved in bombings and assassinations in the late 1940s. Akef helped inspire the foundation of the Muslim American Society (MAS) during his trips to the U.S. in the early 1990s, a 2004 Chicago Tribune article said. Brotherhood members founded MAS and continued to be inspired by Brotherhood ideology, Shaker Elsayed, imam of the Falls Church, Va. based Dar al-Hijrah Islamic Center, told the Tribune. Elsayed generated controversy last spring after he endorsed partial female genital mutilation during a sermon. He remains on the job. Omeish, one of Dar Al-Hijrah board members responsible for Elsayed's continued employment, prayed that Akef be placed "in the higher paradise with the prophets, the pious, and the martyrs, whose company is exalted. The best of people is he who lives longer and perfected his deeds. I remember this giant man, I remembered his smile and the warmth of his faith, as a pious guide, a compassionate father, a decisive leader, and an ascetic laborer." Omeish acknowledged his past Brotherhood membership during a 2011 talk at American University, calling it a "wonderful experience." He also lavished praise on the Muslim Brotherhood last December in another Facebook post. Similarly, this was not Awad's first time toeing the Muslim Brotherhood party line. "We congratulate the Egyptian people and their new president on this great achievement in Egypt's struggle for freedom," Awad said after the Brotherhood's 2012 election victory in Egypt. Other CAIR leaders defended the Muslim Brotherhood on social media against claims it engaged in authoritarian tactics before it fell from power in July 2013. Awad also defended Turkey following last year's failed coup despite Islamist President Tayyip Recep Erdogan's transformation of his country into a police state where dissent is illegal. Awad's past membership in the Muslim Brotherhood is documented in internal records seized by the FBI. A telephone list places Awad on the Brotherhood's Palestine Committee, which was tasked with providing political and financial support for Hamas in the United States. Another pro-Brotherhood individual who serves with Omeish on the Dar Al-Hijrah board eulogized Akef. Akram Elzend, a co-founder of the Muslim Brotherhood-linked Egyptian Americans for Democracy and Human Rights (EADHR), posted his own tribute to Akef on Facebook: "The Sheikh of the Mujahidin has died #Farewell_Akif," Elzend wrote. 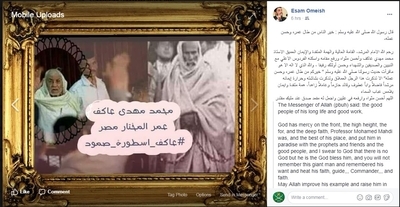 Elzend also alluded to supporting the Muslim Brotherhood in a March 2015 Facebook post emblazoned with the Brotherhood's crossed sword-logo that linked to an article written by the group's spokesman vowing to "liberate Egypt from the grip of this bloody coup." EADHR co-founder Hany Saqr eulogized Akef as someone who could not be described with words. "May Allah repose the martyr Mr. Mohamed Mahdi Akef and elevate him in the higher paradise and make his blood be upon them who did him injustice," Saqr wrote on Facebook. Those internal Palestine Committee records which tie Awad to the Brotherhood network also identify Saqr as a onetime "Masul" or leader of the American Brotherhood's Administrative Office for East America. Osama Abu Irshaid, a board member of the United States Council of Muslim Organizations (USCMO) together with Awad, joined in the chorus of Akef mourners. "May Allah repose Akef and all the martyrs of injustice in Egypt; may Allah curse their killers, those who enslave Egypt and their supporters, may Allah reward the liked of Habib according to their malicious acts," Abu Irshaid wrote. Abu Irshaid has his own past connection with a Palestine Committee entity. He served as editor of Al-Zaitounah, a pro-Hamas Arabic periodical published by the now-defunct Islamic Association for Palestine (IAP). IAP was the Palestine Committee's propaganda arm. Support for Akef showed particular intensity among leaders associated with Egyptian Americans for Freedom and Justice (EAFJ), who have shown strong pro-Brotherhood sympathies for years. President Hani Elkadi eulogized Akef as a hero who "died holding his head high; he asked for no mercy, he did not entreat his jailers, or his executioners. The hero and the martyr died giving an example in patience, defiance, manhood, and steadfastness in truth." Elkadi made several other Facebook posts mourning Akef. EAFJ spokesman Mahmoud ElSharkawy hailed Akef as the "sheikh of the revolutionaries" who was martyred while in prison. "May Allah rest the soul of the captive and the martyr, and we ask Allah to grant us the best of end on the path of truth and martyr without any alteration," ElSharkawy wrote. Elkadi and ElSharkawy's support for Brotherhood-linked Egyptian terrorists is made clear by their numerous social media posts. Formal memorial services for Akef were arranged by EAFJ-linked people in New York and in New Jersey. 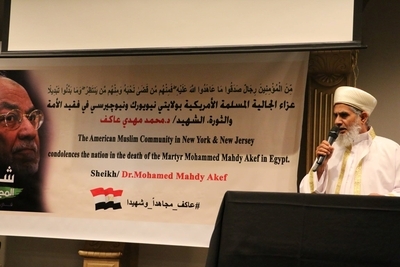 A banner at the New Jersey event called Akef the "Sheikh of the Mujahideen" in Arabic and described him as a martyr in both English and Arabic. EAFJ co-founder Sheikh Mohamed Elbar of Brooklyn's Islamic Center of Bay Ridge eulogized Akef as a martyr and a "mujahid" or holy warrior. Elbar belongs to the International Union of Muslim Scholars headed by Qaradawi, the Muslim Brotherhood ideologue and EAFJ co-founder. "We ask Almighty Allah to elevate Mahdi Akef to the ranks of the martyrs ... Oh Allah, he died as a Mujahid for your cause, so grant him the status of the Mujahideen," Elbar said. Speaker Hemmi Khairallah likewise described Akef as a martyr and warned that Muslims in America were under attack from "Zionists" and "Crusaders." Elbar's mosque held a separate memorial service for Akef. It's not uncommon for members of an immigrant community to mourn a prominent figure from their homelands. But Akef led a religious movement which seeks global dominance and which cultivated an Islamist ideology that inspires Sunni terrorist groups throughout the world. His U.S.-based mourners can continue trying to deny their Brotherhood affinity, but actions speak louder than words. If the leader you pray God places "in the higher paradise with the prophets, the pious, and the martyrs" led a global Islamist movement, sanctioned terrorism and served in a secretive, violent Brotherhood branch, you've tipped your hand.